Established in 1922, the company reincorporated in 1928 and adopted its present name in 1959. As of 2017 the company had around 64,000 employees worldwide and annual revenues of approximately US$25.35 billion. More than 90% of Raytheon's revenues were obtained from military contracts and, as of 2012, it was the fifth-largest military contractor in the world. As of 2015[update], it is the third largest defense contractor in the United States by defense revenue. In 1961, the British electronics company A.C. Cossor merged with Raytheon, following its sale by Philips. The new Company's name was Raytheon Cossor. The Cossor side of the organisation is still current in the Raytheon group As of 2010[update]. 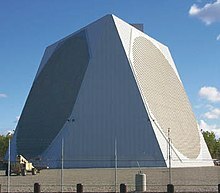 In October 2014, Raytheon beat rivals Lockheed Martin and Northrop Grumman for a contract to build 3DELRR, a next-generation long-range radar system, for the US Air Force worth an estimated $1 billion. This contract award was immediately protested by Raytheon's competitors, Lockheed Martin and Northrop Grumman. After re-evaluating the bids following these protests, the US Air Force decided to delay awarding the 3DELRR EMD contract until 2017, and was to issue an amended solicitation at the end of July 2016. In May 2015, Raytheon acquired cybersecurity firm Websense, Inc. from Vista Equity Partners for $1.9 billion and combined it with RCP, formerly part of its IIS segment to form Raytheon|Websense. In October 2015, Raytheon|Websense acquired Foreground Security, a provider of security operations centers, managed security service solutions and cybersecurity professional services, for $62 million. In Januar 2016, Raytheon|Websense acquired the firewall provider Stonesoft from Intel Security for an undisclosed amount and renamed itself to Forcepoint. In July 2016, Poland's Defence Minister Antoni Macierewicz planned to sign a letter of intent with Raytheon for a $5.6 billion deal to upgrade its Patriot missile-defence shield. In 2017, Saudi Arabia signed business deals worth billions of dollars with multiple American companies, including Raytheon. For the fiscal year 2017, Raytheon reported earnings of US$2.024 billion, with an annual revenue of US$25.348 billion, an increase of 5.1% over the previous fiscal cycle. Raytheon's shares traded at over $164 per share, and its market capitalization was valued at over US$51.7 billion in November 2018. As the vast majority of Raytheon's revenues have been obtained from defense contracts, there has been a tight relationship of cooperation between itself and the U.S. Department of Defense and other U.S. government departments and agencies (e.g. in the Fiscal Year 2007 the National Science Foundation awarded Raytheon $152 million in grants, more than to any other institution and organization in the country, for managing NSF South Pole Station). This, along with heavy lobbying, has led to perennial charges of influence peddling. Raytheon, for instance, contributed nearly a million dollars to various defense-related political campaigns in the presidential election year of 2004, spending much more than that on lobbying expenses. And there are many tight ties between the company and all levels of government. For example, Richard Armitage, a former United States Deputy Secretary of State, is linked to the company through consultancy work. John M. Deutch, a former U.S. Director of Central Intelligence, sits on the board of directors, along with Warren Rudman, a former Senator. On the other hand, Raytheon has also been involved in several contract disputes with the U.S. Government. In March 1990, Raytheon pleaded guilty to one felony count of illegally obtaining classified Air Force budget and planning documents. U.S. District Judge Albert V. Bryan, Jr. imposed a $10,000 criminal fine for one felony count of "conveyance without authority" and $900,000 in civil penalties and damages. The documents allegedly gave Raytheon an unfair advantage against its competitors in bidding for weapons contracts. Although the plea only involved 1983 Air Force documents, United States Attorney Henry Hudson said Raytheon also illegally obtained a wide range of secret Pentagon documents. "The Patriot missile system was not the spectacular success in the Persian Gulf War that the American public was led to believe. There is little evidence to prove that the Patriot hit more than a few Scud missiles launched by Iraq during the Gulf War, and there are some doubts about even these engagements. The public and the United States Congress were misled by definitive statements of success issued by administration and Raytheon representatives during and after the war." Just one year earlier, on October 14, 1993, Raytheon paid $3.7 million to settle allegations that it misled the United States Department of Defense by overstating the labor costs involved in manufacturing Patriot missiles. "The recovery of this money is yet another warning to contractors that the Truth in Negotiations Act's information disclosure requirements will be strictly and sternly enforced," Frank Hunger, assistant attorney general, said in a statement. Allegations of bribery were made against Raytheon in 1995 in connection with its efforts to win a 1.4 billion dollar radar contract from Brazil for the SIVAM project. SIVAM, the acronym for "System for Vigilance over the Amazon," was a complex radar surveillance system for use in monitoring the Amazon rainforest, allegedly to curb the trafficking of narcotics and to curb illegal logging or burning of the forest. Brazilian police wiretapped a telephone conversation between a special advisor to the Brazilian President Fernando Henrique Cardoso, and Raytheon's operative in Brazil, Jose Afonso Assumpcão. According to transcripts published in the Brazilian national weekly Isto É, when Assumpcão told Gomes dos Santos that Brazilian Senator Gilberto Miranda might block the Raytheon contract, Gomes dos Santos responded, "Damn, did you already pay this guy?". Gomes dos Santos and Brazil's aviation minister resigned because of allegations that this conversation suggested that bribes were paid. Nonetheless, Raytheon ultimately was awarded the contract after lobbying by the administration of U.S. President Bill Clinton. In 1996, a corporation called AGES Group filed a lawsuit against Raytheon in a federal court in Alabama over a $450 million contract to service C-12 Huron and U-21 military aircraft. The Boston Herald reported that AGES alleged that the security firm Wackenhut Corporation, hired by Raytheon, used video and audio surveillance to spy on a consulting firm hired by AGES to help it prepare its bid. AGES also alleged that stolen confidential pricing documents were turned over to Raytheon. Both Raytheon and AGES had been vying for the contract, which Raytheon had held for decades but AGES won in 1996. On May 12, 1999, Reuters reported that Raytheon would pay $3 million to AGES Group and purchase $13 million worth of AGES aircraft parts to settle the AGES lawsuit. The settlement was exceptional in that the parties agreed that judgment would be entered against Raytheon, legally establishing the validity of AGES' allegations. 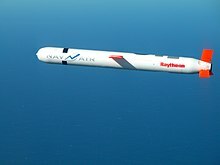 In October 1999, Raytheon was the subject of a number of securities class action lawsuits alleging it had issued a series of materially false and misleading statements including overstating the company's 1997 and 1998 revenues, concealing cost overruns and inflating its financial results. The suits were brought in response to a massive drop in value of Raytheon's common stock as traded on the New York Stock Exchange. On Tuesday, October 12, 1999, Raytheon shares traded at about 45% below their level on October 11, 1999. The plunge in stock prices was triggered by a Wall Street Journal report that Raytheon was over cost or behind schedule on more than a dozen fixed-price defense contracts. This crash represented a loss of about $8 billion in market value in a single day. On May 13, 2004 Raytheon reported that it had reached a preliminary agreement to pay $410 million in cash and securities to settle a class-action lawsuit alleging it misled investors by not disclosing difficulties on various Pentagon and construction projects five years before. On April 24, 2006 in a statement released by Raytheon, CEO Swanson admitted to plagiarism in claiming authorship for his booklet, "Swanson's Unwritten Rules of Management," after a report by The New York Times. On May 2, 2006, Raytheon withdrew distribution of the book. The following day, the company's board of directors announced that "In response to this matter, the Board has decided not to raise Mr. Swanson's salary above its 2005 level, and will reduce the amount of restricted stock for which he is eligible in the coming year by 20 percent." In August 2010, Raytheon announced that it had partnered with a jail in Castaic, California to use prisoners as test subjects for the new non-lethal Silent Guardian active denial system that "[...] penetrates about a 64th of an inch under your skin. That's about where your pain receptacles are. So it's what it would feel like if you just opened up the doors of a blast furnace." In 2010 Raytheon developed an "extreme-scale analytics" system named Rapid Information Overlay Technology (RIOT), which allows the user to track people's movements and even predict their behaviour by mining data from social networking sites including Facebook, Twitter, Gowalla, and Foursquare. Raytheon claims that it has not sold this software to any clients, but has shared it with US government and industry. A company spokesperson told PC magazine in 2013 that "Raytheon, as a leader in cybersecurity, offers advanced capabilities to government customers. We're focused on providing them the best available solutions that meet their constantly evolving requirements." Raytheon has patented a number of weapon designs which allow for the use of depleted uranium. For instance there is the patent "Missile warhead design" (1997) which suggests the use of tungsten but adds that "In addition, other ballast sizes and other materials such as lead or depleted uranium may be used without departing from the scope of the present invention". There is also the patent "Guided kinetic penetrator" (2005) which patents "9. The projectile guidance system of claim 1, wherein the kinetic penetrator body comprises at least one of tungsten, carbide steel, and depleted uranium". The patent "Improved missile warhead design" (1998) which patents "2. The invention of Claim 1 wherein the ballast mechanism (16) includes tungsten, lead and/or depleted uranium material(s)", the "Cluster explosively-formed penetrator warheads" patent (2011) which patents "The spherically-shaped explosive device of claim 1, wherein each of the plurality of liners comprises a material selected from a group consisting of copper, molybdenum, tungsten, aluminum, tantalum, depleted uranium, lead, tin, cadmium, cobalt, magnesium, titanium, zinc, zirconium, beryllium, nickel, silver, and combinations thereof", and the "Low-collateral damage directed fragmentation munition" patent (2014) which uses a tungsten or uranium ring ("The ring 44 may be made of tungsten or depleted uranium, to give non-limiting examples") to direct the energy of the weapon. ^ a b c d e f "Raytheon Company 2017 Annual Report (Form 10-K)". sec.gov. United States Securities and Exchange Commission. January 2018. ^ Missile maker hopes to diversify, create technology for peacetime Archived 2012-02-11 at the Wayback Machine. Sazhightechconnect.com. Retrieved on 2012-02-04. ^ "Raytheon". Fortune. Retrieved 2018-11-15. ^ "Defense News Top 100". Defense News Research. 2012. Retrieved 2013-01-01. ^ "Top 100 for 2015." Defense News. 2015. Retrieved on 2016-07-26. 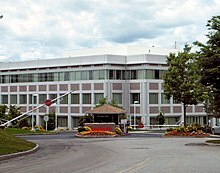 ^ New Raytheon Headquarters to Open October 27 in Waltham, Mass. Archived 2012-03-14 at the Wayback Machine October 22, 2003 Raytheon. ^ Raytheon Australia. History. Archived 2007-08-30 at the Wayback Machine Raytheon Marketing Material. ^ Raytheon Announces Agreement to Purchase BBN Technologies Archived 2012-05-11 at the Wayback Machine WALTHAM, Mass., September 1, 2009. PRNewswire. ^ Mehta, Aaron (22 January 2015). "US Air Force to Reevaluate 3DELRR Award". Retrieved 7 August 2017. ^ Jaisinghani, Sagarika (2015-04-25). "Raytheon to buy cybersecurity firm Websense in $1.9 billion deal". Reuters. Retrieved 2018-10-30. ^ Bach, James (2016-01-14). "Raytheon-Websense joint cyber venture changes name to Forcepoint". Washington Business Journal. Retrieved 2018-10-31. ^ "Raytheon broadens cyber capabilities with acquisition of Foreground Security". PR Newswire. 2015-10-05. Retrieved 2018-10-31. ^ "Raytheon Paid $62M for Foreground Security". TransactionView. Retrieved 2018-10-31. ^ Riley, Duncan (2016-01-14). "Raytheon|Websense acquires Stonesoft from Intel Security, renames combined company Forcepoint". SiliconANGLE. Retrieved 2018-10-31. ^ "Rocketing around the world". The Economist. ISSN 0013-0613. Retrieved 2016-07-23. ^ "Poland moves towards multi-billion-euro Patriot missile deal". Retrieved 2016-07-23. ^ "Saudi Arabia agrees to buy $7 billion in precision munitions from U.S. firms: sources". Reuters. November 23, 2017. ^ "Raytheon Arm Wins $302M Deal to Boost Saudi Arabia's Defense". Nasdaq.com. December 13, 2017. ^ "Raytheon: Investors: Annual Reports". investor.raytheon.com. Retrieved 2018-11-07. ^ Raytheon Company (10 March 2010). "Raytheon Announces Executive Appointments". ^ Forcepoint. "Raytheon|Websense is now Forcepoint™". www.prnewswire.com. Retrieved 2016-02-19. ^ Communications, Raytheon Corporate. "Raytheon News Release Archive". ^ "Raytheon Company (RTN)". Yahoo! Finance. May 1, 2015. ^ Raytheon Corporate Communications. "Raytheon". ^ Raytheon Announces Revolutionary New 'Cockpit' for Unmanned Aircraft – an Industry First Archived 2009-08-19 at the Wayback Machine Falls Church, Virginia, October 31, 2006. PR Newswire. ^ Singel, Ryan (December 19, 2007). "FBI E-Mail Shows Rift Over Warrantless Phone Record Grabs". Wired. Archived from the original on June 27, 2018. The FBI uses a Raytheon-developed tool known as the Digital Multimedia Watchdog to record and store phone calls and internet communications between informants and targets of an investigation. That tool can "collect, process and store large amounts of multimedia data, including voice, fax, data and video." ^ Communications, Raytheon Corporate. "Raytheon News Release Archive". Raytheon News Release Archive. Retrieved 2017-10-04. ^ "Raytheon Six Sigma". www.isixsigma.com. Retrieved 2017-10-04. ^ NSF Award Summary: Top 50 Institutions FY 2007. Dellweb.bfa.nsf.gov. Retrieved on 2012-02-04. ^ a b Project on Government Oversight. Spring 2004 The Politics of Contracting. Raytheon Archived 2007-09-06 at the Wayback Machine. ^ Biddle, Frederic M. (March 21, 1990). "Raytheon Fined $1M in Scheme to Defraud Group of Firms Obtained Classified Budget Data". ^ Bush, George H.W. (1991). "Remarks to Raytheon Missile Systems Plant Employees in Andover, Massachusetts". The George Bush Presidential Library. Archived from the original on December 26, 2005. Retrieved 2006-04-05. ^ "Report 102-1086". Activities of the House Committee on Governmental Operations, One Hundred Second Congress First and Second Sessions. 1991–1992. Archived from the original on 2006-05-26. Retrieved 2006-04-05. ^ Krupa, Gregg (1999-05-13). "Raytheon Unit Settles Industrial-Spying Allegations". Boston Globe. Retrieved 2006-04-05. ^ "Raytheon Chairman & CEO Comments Regarding 'Unwritten Rules'". Raytheon News Release. Archived from the original on 2011-03-03. Retrieved 2006-05-02. ^ "Raytheon halts distribution of controversial booklet by CEO". AP/Boston.com. 2006-05-02. Archived from the original on March 4, 2007. Retrieved 2006-05-02. ^ "Statement of Board of Directors of Raytheon Company". Raytheon News Release. Archived from the original on 2012-03-14. Retrieved 2006-05-03. ^ "Zapping Inmates To Control Them: Harmless Or Torture?". NPR. 10 September 2010. ^ Gallagher, Ryan (10 February 2013). "Software that tracks people on social media created by defence firm". Guardian. ^ "Raytheon Riot Software Predicts Behavior Based on Social Media". Retrieved 2016-08-12. ^ "Missile warhead design". Retrieved 7 August 2017. ^ "Guided kinetic penetrator". Retrieved 7 August 2017. ^ "Improved missile warhead design". Retrieved 7 August 2017. ^ "Cluster explosively-formed penetrator warheads". Retrieved 7 August 2017. ^ "Low-collateral damage directed fragmentation munition". Retrieved 7 August 2017. ^ A quick online search using a service such as Google Patents will show more examples of Raytheon patents which include the use of uranium. ^ a b c "Is Raytheon site poisoning St. Petersburg neighborhood?". 2008-04-24. Archived from the original on 2008-04-23. Retrieved 2008-05-06. ^ "Raytheon's Florida Neighbors Sue Over Water Contamination". 2008-05-05. Archived from the original on 2008-05-10. Retrieved 2008-05-06. ^ "Raytheon Site Summary". Florida Department of Environmental Protection. Archived from the original on 2008-10-15. ^ "Florida DEP". Florida Department of Environmental Protection. Archived from the original on 2008-10-15. ^ a b "Environmental Protection Agency". July 13, 2007. Retrieved May 6, 2008. ^ Raytheon (2005). Archived 2007-03-19 at the Wayback Machine. Human Rights Campaign. ^ U.S. Global Leadership Coalition, Global Trust members. Usglc.org. Retrieved on 2012-02-04.